Robots usually require a lot of sensors, radio communication, calculating capacity and possibly low power consumption, to control position, next movements and reduce weight. The Tactigon is the right board for this application, as it is a really small board with 9DoF IMU, Temperature and Pressure sensors, Bluetooth low energy and low power consumption, all connected by an astonishing 32 MHz, 512Kb Flash memory and 80Kb RAM. This small (46,9×15,2×5,5 mm) device allows the maker to design the robot without usual restriction caused by heavy and large breakout board. All you need to realize this is The Tactigon, a motor control board, and motors. 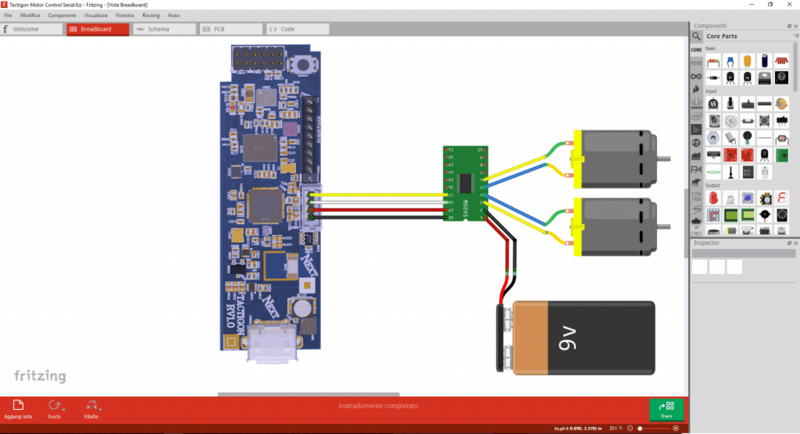 We have chosen a motor driver board (form factor differs from Fritzing sketch) with serial interface. The Tactigon’s GROVE connector exposes the serial1 interface. The connection of the board to The Tactigon requires only 3 wires (4 if powering logic side from The Tactigon) to connect. Motors are powered from an external source, so if high torque is required a properly dimensioned battery can be used. 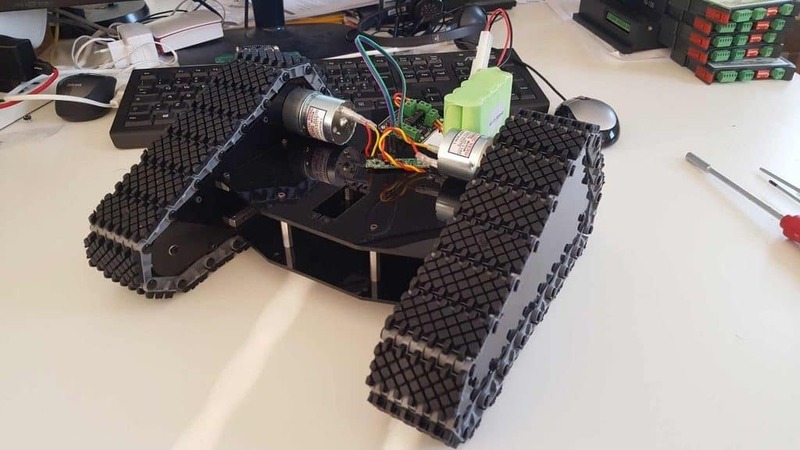 The Tactigon is an interesting alternative in robot development. Maker can get advantages from its integrated Bluetooth Low Energy radio, sensors and GPIO to control other robot’s peripherals as ultrasonic distance or IR obstacle detection sensors. Sketch can be longer as Flash memory is larger than typical development board, and with more RAM too. Arduino IDE Compatibility with The Tactigon is ensured by downloadable Core.